According to the latest report published by the International Monetary Fund (IMF), Regional Economic Outlook, Iran is expected to see non-oil growth accelerate from 0.75 percent in 2016 to almost 3.5 percent in 2017. The report, which reflects the outlook for Middle East, North Africa, Afghanistan and Pakistan (MENAP) in 2017, shows that across MENAP oil exporters, the sharp fall in oil prices between late 2014 and the second quarter of 2016 was reflected in a surge in fiscal deficits (blue bars in Figure 1.2). The average fiscal deficit reached about 10 percent of GDP in both 2015 and 2016. 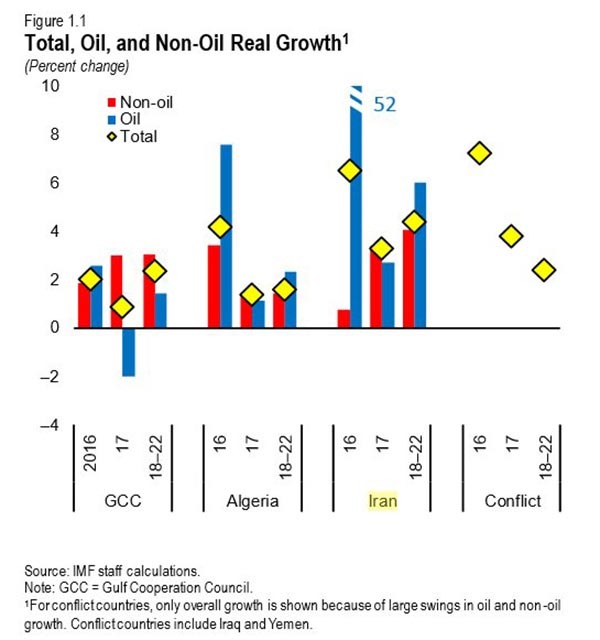 In Iran, the fiscal stance was loosened slightly to support non-oil growth, while in countries in conflict as a whole it tightened. Successful implementation of fiscal plans will be helped by strengthening fiscal institutions. Iran is revamping its public financial management system, including introducing accrual accounting, modernizing the Financial Management Information System, and developing a Treasury single account, the same report confirmed. The report also said that preparations for exchange rate unification are continuing in Iran.